(a) Align the splines of the shaft and install the drive shaft assembly LH using a brass bar and a hammer. Set the shaft snap ring with the opening facing down. Be careful not to damage the drive shaft dust cover, boot or oil seal. Move the drive shaft assembly while keeping it level. (b) Apply a total of 0.1 to 0.3g (0.00353 to 0.0105 oz.) of Toyota Body Grease W to the 8 areas shown in the illustration. 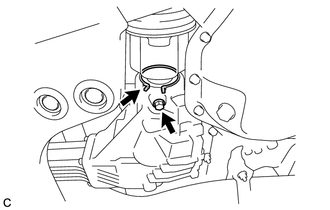 Do not apply grease to the serrations or installation hole of the front speed sensor. (a) Install the front drive shaft assembly RH. (b) Install the bearing bracket hole snap ring and a new bolt. Do not damage the boot or oil seal. (c) Apply a total of 0.1 to 0.3g (0.00353 to 0.0105 oz.) of Toyota Body Grease W to the 8 areas shown in the illustration. 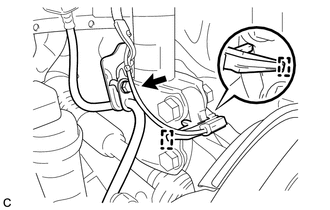 (a) Install the front speed sensor and front flexible hose with the bolt. Do not twist the front speed sensor when installing it. First install the speed sensor harness bracket, and then install the flexible hose bracket. 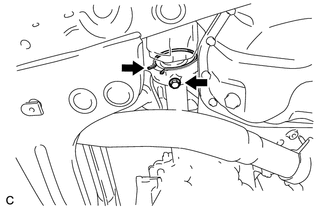 (b) Install the front speed sensor to the steering knuckle with the bolt. 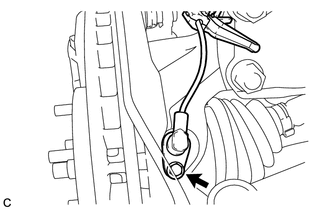 Prevent foreign matter from attaching to the front speed sensor tip. 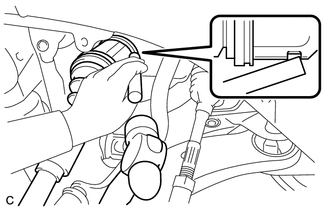 Firmly insert the front speed sensor body into the steering knuckle before tightening the bolt. 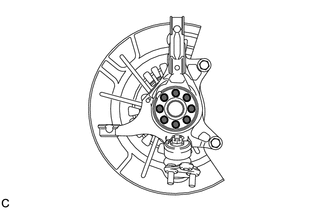 After installing the front speed sensor to the steering knuckle, make sure that there is no clearance between the front speed sensor stay and steering knuckle. Also make sure that no foreign matter is stuck between the parts. 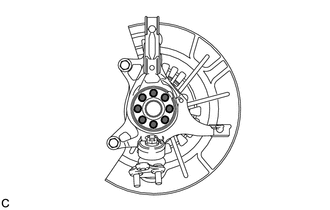 To prevent interference between the front speed sensor and magnetic rotor, do not rotate the front speed sensor body during or after the insertion of the front speed sensor body to the steering knuckle. 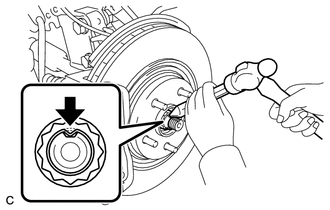 (a) Clean the threaded parts on the front drive shaft and a new front axle shaft nut using a non-residue solvent. Be sure to perform this work for a new drive shaft. Keep the threaded parts free of oil and foreign matter. (b) Install the new front axle shaft nut. (c) Using a chisel and hammer, stake the front axle shaft nut.